What I pinned to my purse this week. Almost literally the very least I could do, but I couldn't not do it. Our 6-year-old son: Are you going to MARRY him? 10-year-old: No! He’s way too old for me. 6-year-old: Also, boys can’t marry other boys. 10-year-old, me, and Dad, in unison: Yes they can. 6-year-old, cheerfully unconcerned: Oh. Okay. I know I thank you a lot, but I wanted to again, for supporting me as a writer, and supporting me as a member of the LGBT community. Thank you for writing how you do. Thank you for being someone I can comfortably send this message to. That's part of a message I got today from a young woman I've never met, but with whom I've exchanged several emails about writing and publishing--and, occasionally, LGBT issues. Look, I'm a boring, straight, stay-at-home mom who writes about fictional people, some of whom are LGBT, because I like all kinds of love stories. But I consider myself practically a poser; or at least, not really someone who's putting near as much effort as she could into being the good ally I'd like to be. So what kind of world are we living in where someone as half-assed about LGBT kindness as me is getting thanked for being someone who's safe to send a message to about such issues? It breaks my freaking heart. We've come a long way, but we have a still longer way to go yet. If you're an ally too, and you haven't said so, say so. 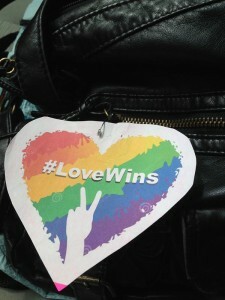 Pin a rainbow heart on your jacket. Chances are, someone out there is going to feel comforted when they see it. Even if they aren't feeling up to saying anything. Thank you for this post. I've been avoiding all social media for the past few days, overall, because it's just too much. You're right - all of this is heartbreaking. Love is love is love, and I wish so badly that more people could just accept this truth. Here's to rainbows. Your suggestion reminds me of John Steinbeck's basic message in The Grapes of Wrath - be kind on a daily basis. You might not change the entire world in one fell swoop, but you just might help one person that day, if you're lucky. Imagine if everyone adopted that mentality - I'll just be kind today. It's so simple that it's ridiculous. You have a dear heart as well, and I'm so glad you're placed right there in schools where the kids can come to you if they need someone to listen! I definitely get the avoidance of social media--often a big catastrophe in the news has made me feel the same. This time, though, for whatever reason, I was able to keep it together and stay clear-headedly angry enough to post some, "All right dammit, enough is enough" things. Yeah, why is such a simple and obvious message so hard to grasp? Why do so many people live instead on the rule of "I must destroy what is different and what I (probably wrongly) perceive as threatening"? Sigh. Longstanding mystery of humankind. Hah, yes, that was me! I'd forgotten the peanut M&M costume, but indeed, that'd be the eldest as the peanut. Nonetheless, you and I are still obviously young and cool, because, um, wibblywobblytimeywimey hand-waving.